LAS VEGAS, NV – Feb. 27, 2019 – Tim Shaffer was in route to a dominating performance at The Dirt Track at Las Vegas for the FVP Platinum Battery Showdown presented by Star Nursery, leading every lap, but with five laps to go worry set in. “I knew the laps had to be getting close,” Shaffer said, as the 30-lap Feature saw eight cautions by lap 26. After multiple attempts of restarting the race on lap 26, Series officials called for an Open Red, stopping the cars on the front stretch and allowing the teams to refuel their cars. After the cars were refueled, and the race went back to green on lap 26, Shaffer acted like nothing changed, commanding the lead once again all the way to victory lane – claiming his 26th World of Outlaws NOS Energy Drink Sprint Car Series win and his fourth win at The Dirt Track at Las Vegas. While everything worked in Shaffer’s favor, Fresno, Calif. native Giovanni Scelzi was not as fortunate. After falling to fourth, from third, at the beginning of the race, he worked his way to second place by lap 10 and began closing in on Shaffer while he entered lap traffic. Scelzi in the #83JR for Roth Motorsports never let Shaffer out of his sight in the closing laps of the race. He even stole the lead from him on one of the restart attempts on lap 26, but a caution was thrown before the field could complete at lap, putting him back in second place. Once the field took the green flag, after stopping to refuel, Scelzi stayed on pace with Shaffer until entering turns three and four too aggressively, hitting the cushion and falling back two positions. 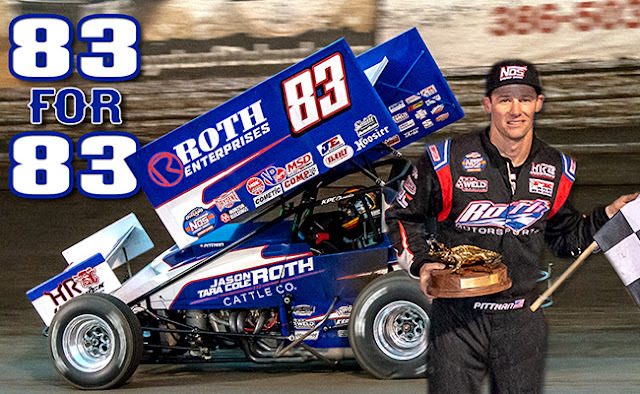 Roth Motorsports has had a strong start to the season with Daryn Pittman winning the two season opening races at Volusia Speedway Park – also resulting in his third DIRTcar Nationals championship and Roth Motorsport’s first. Pittman finished seventh, maintaining his points lead from Florida, now eight points ahead of second place Donny Schatz. Schatz also had a strong run coming from 11th to third – his second podium finish in three races. Like Schatz, Kaeding had to climb his way through the field, finishing second after starting 10th. When Shaffer entered lapped traffic, you could throw a blanket over he, Scelzi and Kaeding. While Scelzi stocked Shaffer, Kaeding in his Sides Motorsports car was close behind stocking them both. After Scelzi bounced off the cushion, the 21-time Series winner capitalized on the opportunity, darting by the black #83JR to take second place. With a clear track in front of him he could focus on hunting down Shaffer. The only problem was Shaffer had mastered the high line of the track, keeping more than a second between himself and Kaeding by the end of the race. Understanding how to drive the Las Vegas track was key to winning, Shaffer said. He credits his team for giving him a good handling car that could handle the track conditions. While Shaffer has more than 20 wins, and has raced with the Series for several years, beating the star-studded field of World of Outlaws drivers is still special to him. World of Outlaws NOS Energy Drink Sprint Car Series action at the DIRTcar Nationals resumes tomorrow at The DIRT Track at Las Vegas. As always, you can catch all the action from the Nationals and the World of Outlaws on DIRTVision.com. FEBRUARY 26, 2019 – For the third consecutive season, the United Racing Club (URC) welcomes Capitol Renegade back as the series title sponsor. Capitol Renegade, a division of Capitol Cadillac, was formed in 2010 through the organization’s involvement in the motorsports industry. Since their inception as a renegade dealer, they have become the leader in new innovative ideas and changes to the Renegade brand. The relationship between URC and Capitol Renegade was forged from a joint passion for the motorsports industry and a desire to give back to those who participate in the sport. Wayne Quackenbush, general manager of Capitol Renegade, has been involved in racing for 45 years. His father raced, Quackenbush himself raced stock and sprint cars, and now Quackenbush’s son, David, races 360 sprint cars. URC president Rick Weller, whose son Josh (2018 series champion) races the full URC schedule, said the partnership is a very good fit. The partnership has been beneficial for both parties over the last two seasons, leading to the extension of the series sponsorship. While Capitol Renegade’s involvement in the local racing community extends much further than the partnership with URC, Quackenbush explained that the values and nature of the club suit his company’s style. The Capitol Renegade United Racing Club looks to kick off the 2019 season on April 14 at Bridgeport Speedway for their 72nd season opener. While much of the 2018 season was lost due to inclement weather, Weller said he hopes Mother Nature is kinder to the local racing community this year. SELINSGROVE, Pa. – Selinsgrove Speedway’s annual Motorsports Show at the Susquehanna Valley Mall in Selinsgrove started today (Feb. 24) and will run through this Friday, March 1. Race fans can check out more than 30 full-size race cars plus go karts throughout the week during regular mall hours. The display includes a variety of 410, 360, and 305 sprint cars, late models, pro stocks, roadrunners, micro sprint cars, and a midget sprint car. The speedway’s defending stock car champions Bryan Bernheisel (super late models), Kyle Bachman (pro stocks), and Keith Bissinger (roadrunners) have their cars in Center Court. 2018 top five 360 sprint car teams with cars on display include Jason Shultz, Chad Layton, and Cody Keller. Former champion and last year’s winner of the American Sprint Car Series event Blane Heimbach has a car in the show. Defending National Opener winner Ryan Smith has the new Heffner Racing No. 72 sprint car on display as well. Brett Schadel’s team is debuting a brand-new late model along with the late models driven by Ken Trevitz, Nathan Long, Dylan Yoder, Andrew Yoder, Nathan Herman, and others. The tribute cars of the late Kramer Williamson and Jim Nace are also at the mall this week. Track officials will hold the annual season kick-off ceremony in the mall’s center court at 7:30 p.m. Friday featuring announcements and driver interviews. Reserved seats can be renewed at the show Monday through Thursday 6 p.m. until closing and Friday until the start of the season kickoff ceremony at 7:30 p.m. in the mall’s Center Court. 2019 schedules are also available. All race cars will be removed from the mall at 9 p.m. Friday. Selinsgrove Speedway’s 2019 Season Opener is slated for 6 p.m. Saturday, April 6, featuring the 360 sprint cars, super late models, pro stocks, and roadrunners. 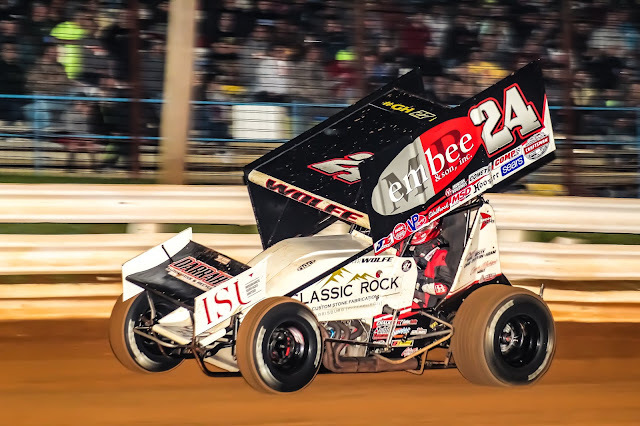 Williams Grove Speedway will open the 2019 season coming up on Sunday afternoon, March 17 at 2 pm as the track begins to celebrate its 80th anniversary season of auto racing with a program of Lawrence Chevrolet 410 sprint cars. Last year, on March 11, Mechanicsburg’s Lucas Wolfe opened the season by scoring the lidlifter before going on to claim two more victories at the oval while on his way to claiming the 2018 track title. And Wolfe will be back for more in 2019 aboard Michael Barshinger’s No. 24, making an effort to back up his track crown. The 32-year old reigning champion will meet fans and sign autographs on opening day from the time that gates open at noon until 12:45 pm. 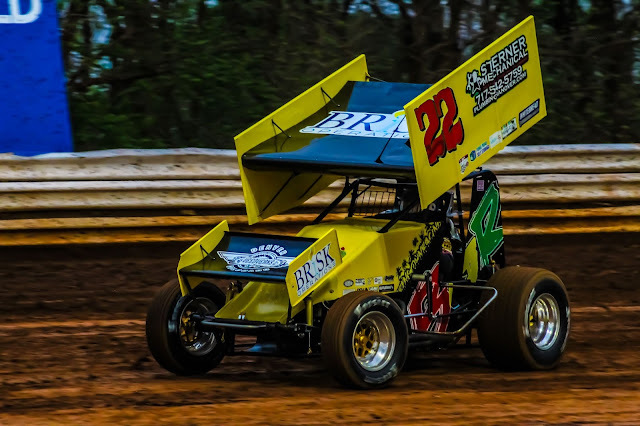 And from there Wolfe will embark on his third season behind the wheel for Barshinger at Williams Grove Speedway and he’s fairly optimistic about the races to come this season. “I think we're in pretty good shape,” Wolfe said of his program recently as he pondered the year that lies ahead. 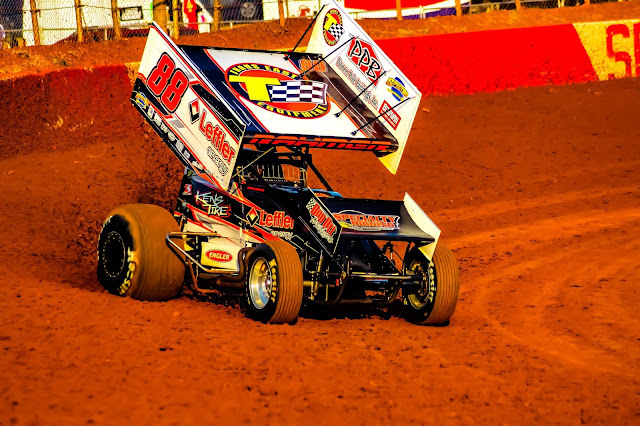 Wolfe got his feet wet for the year by competing recently in Florida and will race regularly at Williams Grove this season, using lessons that he and his team learned last year in order to make this year another success. “I think we’re looking to implement some of those ideas over time as the season progresses,” he noted. Just like last season, Wolfe will also pilot a mount owned by Jim and Laura Allebach at select events during the year ahead including in 360 sprint competition at Williams Grove. Presented by Hoosier, Opening Day 2019 Williams Grove Speedway featuring 410 sprint cars only is set for Sunday afternoon, March 17 at 2 pm with gates opening at noon. Courtesy of Williams Grove Speedway and Hoosier Tires, Hoosier giveaways are slated for the season lidlifter for both fans and racers alike. Adult general admission is set at $15 with youth ages 13-20 admitted for just $10. Youth ages 12 and under are always admitted for FREE at Williams Grove Speedway. A new era begins at Lincoln Speedway this coming Saturday afternoon. As will a new relationship between two iconic members of the Adams County community. Gene Latta Ford has been serving the Hanover and surrounding areas since 1973 with the business philosophy of “Customers Come First” in the automotive industry. From its humble beginning, Gene Latta has now grown into the number one volume Ford dealer in Adams and York Counties in Pennsylvania and Carroll County, Maryland. 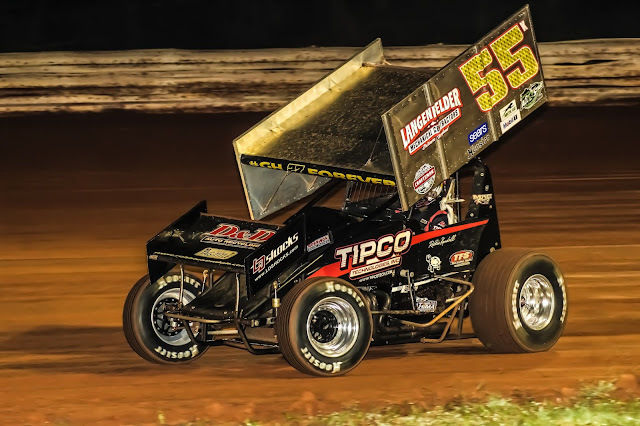 “We are proud to sponsor the 410 sprint division at Lincoln Speedway for the 2019 season, as we feel it’s a great fit for exposure right in our back yard,” said Shawn Groft, general manager of Gene Latta Ford, “These guys have been putting on a great show at Lincoln Speedway for years and years, and we are just glad to be part of it in 2019. Celebrating its 67th year, Lincoln Speedway continues a tradition of offering the world’s toughest, most competitive weekly sprint car racing. Super sprints have comprised the main class of racing at Lincoln since 1965, and the “410” sprints are featured in 29 of Lincoln's 31 race dates this year, with a dozen other racing divisions competing at the Pigeon Hills oval during the upcoming season. As per tradition, Lincoln’s season opener will be held this coming Saturday (the last Saturday in February). Gates for the “Icebreaker 30” will open at noon and racing begins at 2:00 p.m. The season opener will be a sprint-only show and pay $4,000 to win. Both this Saturday’s “Icebreaker 30” and next Saturday’s show (March 2nd) carry rain/snow dates of the next day. 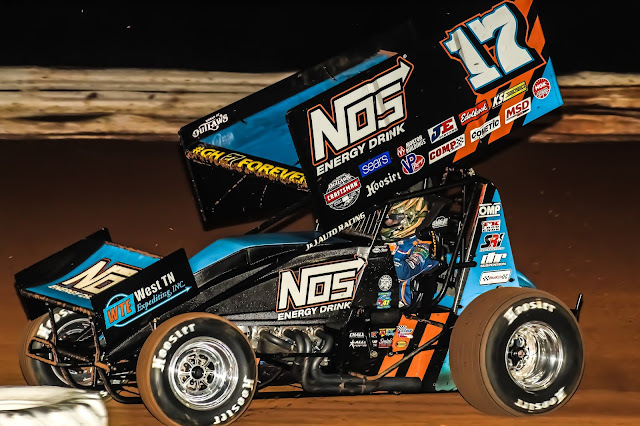 PLACERVILLE, CA — Feb. 20, 2019 — The World of Outlaws NOS® Energy Drink Sprint Car Series is gearing up to return Saturday, March 23, to Placerville Speedway for the fifth consecutive year of high-speed, winged sprint car action. 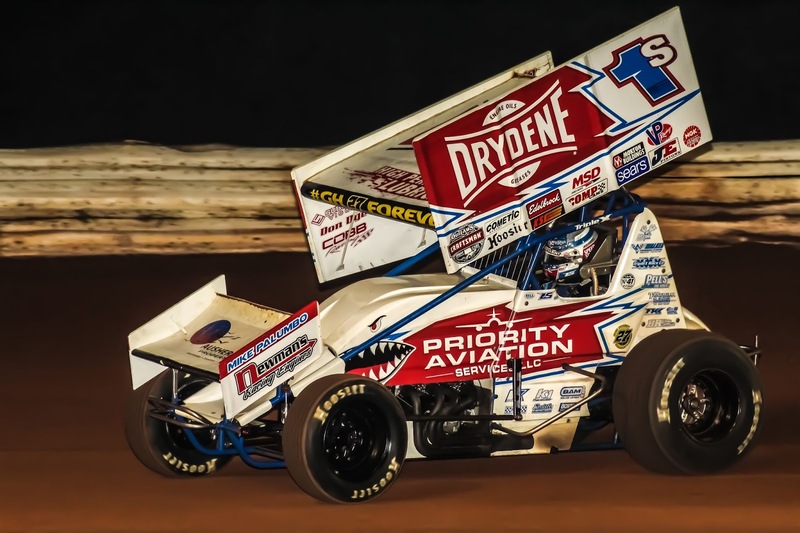 CONCORD, NC – Feb. 20, 2019 – The FVP Platinum Battery Showdown presented by Star Nursery will see the World of Outlaws NOS® Energy Drink Sprint Car Series bring its high-speed thrill show to The Dirt Track at Las Vegas Motor Speedway Wednesday, Feb. 27, and Thursday, Feb. 28. 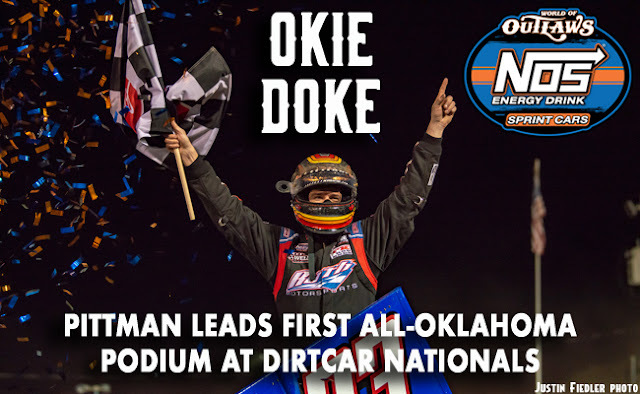 It will also mark the first time in history the World of Outlaws and NASCAR K&N Series are competing on the same night at the same track, bringing two of racing’s biggest powerhouses together. The history-making FVP Platinum Battery Showdown pairs the World of Outlaws NOS Energy Drink Sprint Car Series with the NASCAR K&N Pro Series West for the first time. The Star Nursery 100 K&N Pro Series West will have practice sessions on Wednesday night (Feb. 27) and run their main event Thursday, Feb. 28, as part of a double-feature with the second night of World of Outlaws racing. LVMS has hosted World of Outlaws events at its half-mile Dirt Track dating back to 1996. FVP-sponsored driver Brian Brown will return to compete in the showdown along with last year’s showdown winners Sheldon Haudenschild and Donny Schatz – the 10-time and defending World of Outlaws NOS Energy Drink Sprint Car Series champion. On Wednesday, grandstands will open at 3 p.m., followed shortly after by World of Outlaws NOS Energy Drink Sprint Car Series hot laps and qualifying at 4:30 p.m. The NASCAR K&N Pro Series West practice session will be an hour later. Opening ceremonies are slated to commence at 6:15 p.m., with racing to follow immediately. The Sprint Car Feature will be the first Feature of the night. Thursday’s schedule of events follows the same times as Wednesday. The Sprint Cars will again be the first Feature of the night, and the NASCAR K&N Pro Series West Star Nursery 100 will be the final race of the night. Following the World of Outlaws visit to the Sin City, the Series heads to California, commencing a month-long tour through the Golden State at Thunderbowl Speedway in Tulare, CA, on Friday March 8, and Saturday, March 9. In an effort to meet popular demand and at the request of fans to make access to advanced reserved seat tickets easier, Williams Grove Speedway and the World of Outlaws have joined forces to offer all reserved seat tickets for 2019 Williams Grove World of Outlaws NOS Energy Drink Sprint Car Series events exclusively through the outlaws. As a result, fans who wish to obtain any reserved seats for any of the six World of Outlaws NOS Energy Drink Sprint Car Series dates at the track for 2019 will need to purchase the tickets via the official World of Outlaws website located at www.worldofoutlaws.com/tix or by calling 1.844.DIRT.TIX. Fans should monitor the World of Outlaws website for on-sale dates for all Williams Grove ticket sales. .
As the reserved seat ticket outlet for Williams Grove Speedway outlaws shows in 2019, any and all reserve seat raincheck processing for the shows will be conducted through the World of Outalws as well. 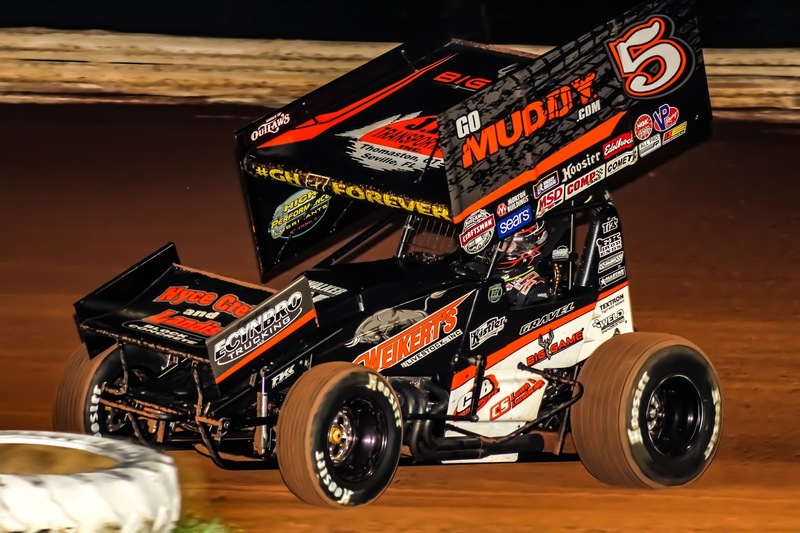 Williams Grove Speedway will continue to offer advance general admission tickets for all speedway World of Outlaws NOS Energy Drink Sprint Car Series events with the standard Williams Grove raincheck policy in effect for all sales. Camping permits and season reserved seats priced at $60 for the full season will continue to be offered at the offices of Williams Grove Speedway, beginning March 1. The World of Outlaws NOS Energy Drink Sprint Car Series will visit Williams Grove Speedway for a trio of two-day shows during the season ahead coming up on May 17 and 18 presented by H & N Landscaping, July 26 and 27 for the Champion Racing Oil Summer Nationals and for the Champion Racing Oil National Open on October 4 and 5. Adult general admission is set at $15 with youth ages 13-20 admitted for just $10. CONCORD, NC – Feb. 18, 2019 – The World of Outlaws NOS® Energy Drink Sprint Car Series will make California its home in March, competing on eight nights at seven different Golden State tracks throughout the month. Among those is the 49er Gold Rush Classic presented by Riebes NAPA at Placerville Speedway, which will now be on Saturday, March 23. The Series will commence its West Coast tour – featuring some of the toughest local competition the Outlaws see all season – March 8 at Thunderbowl Raceway in Tulare, Calif., and will cap the run off on March 30 at Perris Auto Speedway in Perris, Calif.
Brad Sweet, a native of Grass Valley, Calif., will aim to hold off the competition in his home state to add to his win list. 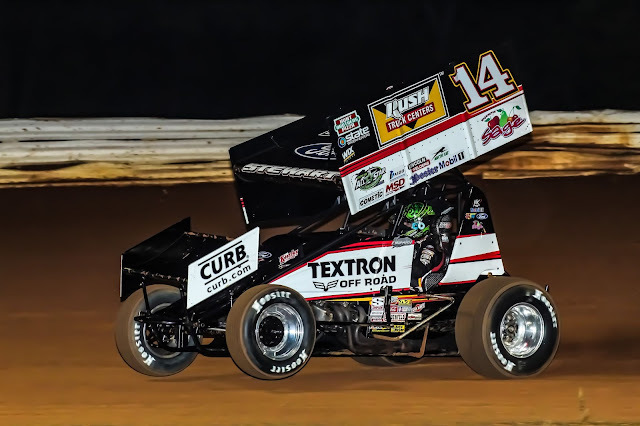 However, Series points leader Daryn Pittman and 10-time Series champion Donny Schatz won’t make it easy, with strong runs to open the season in Florida. Last year, Sweet won at Placerville Speedway after a tight race-long battle with Rico Abreu. The Series will return to the high-octane quarter-mile oval this year on the new date. The World of Outlaws NOS Energy Drink Sprint Cars are also returning to the Mini Gold Cup at Silver Dollar Speedway in Chico, and Keller Auto Speedway at Kings Fairgrounds in Hanford. The Series last visited the Hanford track in 2017, when Logan Schuchart scored the win. Last March in California was a success for first-time winners. Thunderbowl Raceway in Tulare saw a fierce battle between the No. 87 of Aaron Reutzel and the No. 83 of Cory Eliason, as the two traded the lead for several laps with both in search of their first Series win. With four laps to go, Reutzel was able to overpower Eliason and make his first trip to victory lane. Eliason had his day in the sun just a couple of weeks later, commanding the Stockton Dirt Track race from start to finish. No one had anything for the California-native as he become the second driver that month to earn his first Series win. Tickets are now on sale for all West Coast swing races at WorldofOutlaws.com/tix or by calling 844-DIRT-TIX. For the races at Thunderbowl Raceway call 559-688-0909. A portion of proceeds from tickets and a special t-shirt will benefit the California Fire Foundation as the World of Outlaws NOS Energy Sprint Cars looked for ways to give back to those affected by California wildfires over the winter. March 8 – Thunderbowl Raceway, Tulare, Calif.
March 9 – Thunderbowl Raceway, Tulare, Calif.
March 15 – Silver Dollar Speedway, Chico, Calif.
March 16 – Stockton Dirt Track, Stockton, Calif.
March 22 – Ocean Speedway, Watsonville, Calif.
March 23 – Placerville Speedway, Placerville, Calif.
March 29 – Keller Auto Speedway at Kings Fairgrounds, Hanford, Calif.
March 30 – Perris Auto Speedway, Perris, Calif. 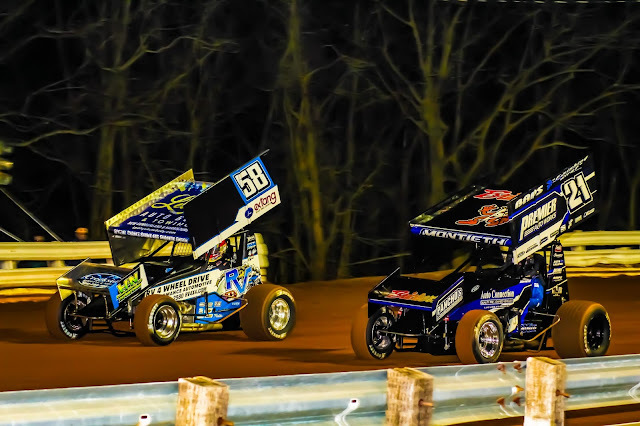 When the 2019 season gets underway at Williams Grove Speedway on March 17, 410 sprint car drivers will be greeted with updated purses along with numerous weekly incentives and bonus prizes to collect on. Purse structures including those for the Hoosier Diamond Series and Yellow Breeches Series races have been updated for the year ahead with winners’ shares in the Diamond and Yellow Breeches events boosted to $4,080 and $3,680, respectively, while the regular show purse has been upped to $3,880 to win, all in honor of the historic oval’s 80th year in existence. Throughout the season, as has been the case the last several years, Fast Tees Screenprinting of Thompsontown will again be paying $300 to set fast time at all oval time trial events in honor of late speedway champion Jimmy Nace. 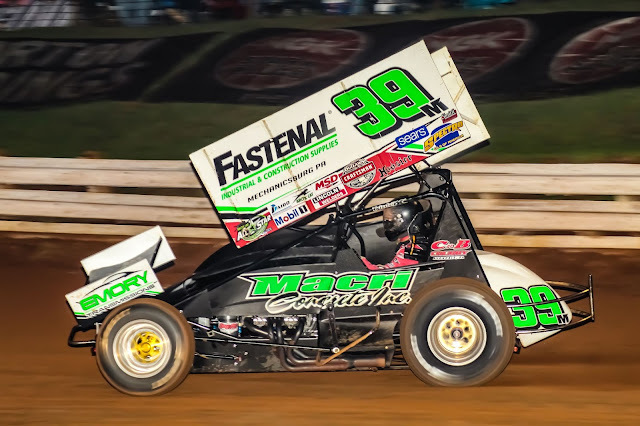 In total, the 2019 Fast Tees Fast Time Awards up for grabs in 2019 will amount to nearly $5,000. Eshenaur & Son fuels of Harrisburg returns to Williams Grove Speedway again in 2019 with the Eshenaur Fuels Last Lap Pass Awards for both regular and visiting open wheel divisions. Eshenaur’s will again offer a $250 last lap pass award to any driver who makes a last lap pass for the win in the 410 sprint car division while a $100 bonus is posted for last lap pass winners in the 358 sprints. Eshenaur’s will also offer $100 bonus last lap awards for all 305 sprint and super sportsman races during the 2019 campaign. In addition, various product certificates will be awarded at numerous events during the season including vouchers for Hoosier Tires and Keizer Wheels. Mechanicsburg - The upcoming season at Williams Grove Speedway finds the track celebrating its 80th anniversary while celebrating 75 consecutive seasons of auto racing with a 31-date slate of events. The 80th anniversary of the track will be showcased on varying occasions during the new season with special pre-race events greeting fans with a focus on driver and fan interaction. Several autograph sessions are planned for select events while hundreds of commemorative 80th anniversary Williams Grove Speedway Posse towels will be handed out to general admission fans at each of three World of Outlaws Tune Up races slated for May, July and September. The facility itself has been busy preparing for the new season ahead with work beginning shortly after the last checkered flag fell in 2018. New clay was added to the speedway surface late in 2018 in an effort to continue great racing action on the best surface possible. Safety concerns were pushed to the forefront once again during the 2018 season and to that end, Williams Grove Speedway continues to evaluate the facility for areas where increased safety measures can be instituted. With that in mind, impact protection devices have been installed around the track for the 2019 racing season. In addition, the oval anticipates making improvement to the backstretch grandstand seating areas by installing handrails to aid spectators in traversing the structure. Also underway is a revision of the speedway’s official website located at www.williamsgrove.com. 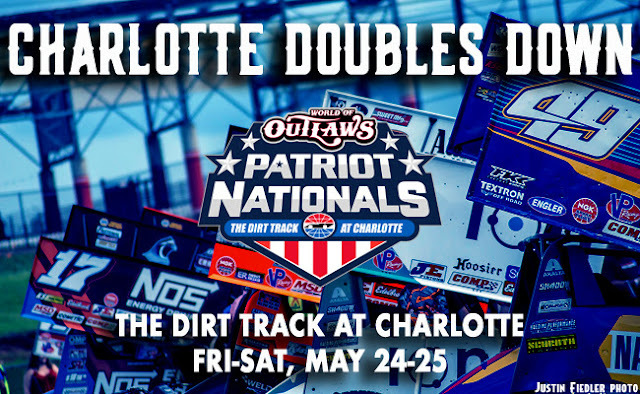 • The Dirt Track at Charlotte’s World of Outlaws NOS Energy Sprint Cars race on the Friday of Coca-Cola 600 week will become the May 24-25 Patriot Nationals, a two-day showcase of patriotism and high-octane sprint car racing at Charlotte’s high-speed, four-tenths-mile oval; track officials also unveiled the race’s new red, white and blue logo on Friday. 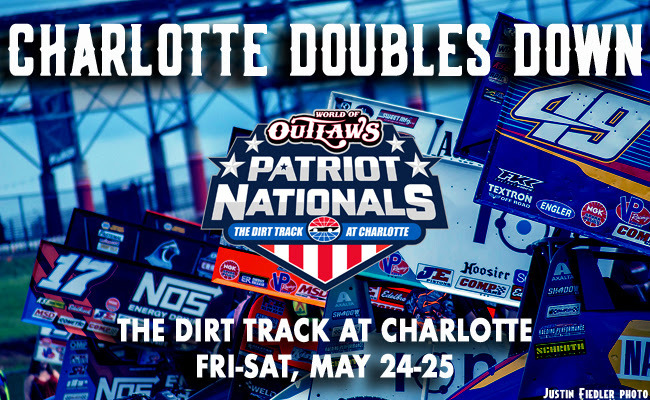 • Two-day passes to the Patriot Nationals start at just $60; To purchase tickets to the May 24-25 Patriot Nationals as well as the 60th running of the Coca-Cola 600 on May 26, visit the speedway’s website or call 800-455-FANS (3267). CONCORD, NC — Feb. 8, 2019 – The Dirt Track at Charlotte will double the amount of competition and entertainment coming to Charlotte’s world-class clay oval in May. Track officials and the World of Outlaws on Friday unveiled the Patriot Nationals, a two-day event May 24-25, featuring the stars of the World of Outlaws NOS Energy Sprint Cars headlining a Friday-Saturday smorgasbord of sprint car excitement less than 24 hours before the green flag for the 60th running of the Coca-Cola 600. BARBERVILLE, Fla. (2/7/2019) - The ‘Big Cat’ Brad Sweet was the man to beat on Thursday evening at Volusia Speedway Park, officially concluding the five-race Ollie’s Bargain Outlet All Star Circuit of Champions presented by Mobil 1 sweep through the Sunshine State with a $5,000 DIRTcar Nationals triumph. BARBERVILLE, Fla. (February 6, 2019) - It took Bixby, Oklahoma’s Shane Stewart eight laps to track down race leader, Daryn Pittman, from the inside of row three, but once he found the back bumper of the Roth Motorsports entry, it was the end of the road for Daryn Pittman, as well as the rest of the field.